Time to run out to your local Barnes and Noble (for those in the United States) and grab your copy of Classic Rock magazine. This publication is huge in Europe. When you want all the big music news, you read Classic Rock magazine! Joe is on the cover, also included in the magazine is a “greatest hits” CD. The disc includes twelve tracks from Joe’s various studio records. A lot of news is unveiled, Joe outlines his plans for 2012! The magazine runs about $15, well worth the price. It will look great with a signature! I live in Macon, GA USA My husband wanted this magazine more than anything and no one in the surrounding counties had this edition. 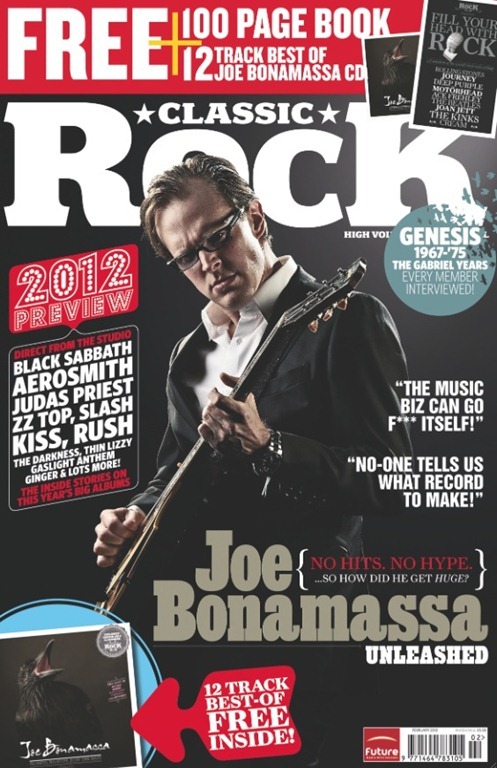 I have tried to order back issue and not available, I tried ebay, not available…I looked in all the stores and even tried to call your office and find a location where I could purchase this edition of classic rock and nothing…My husband is such a die hard Bonamassa fan and would love this magaizine, can you please tell me how I can purchase this edition for him? thank you for your time.